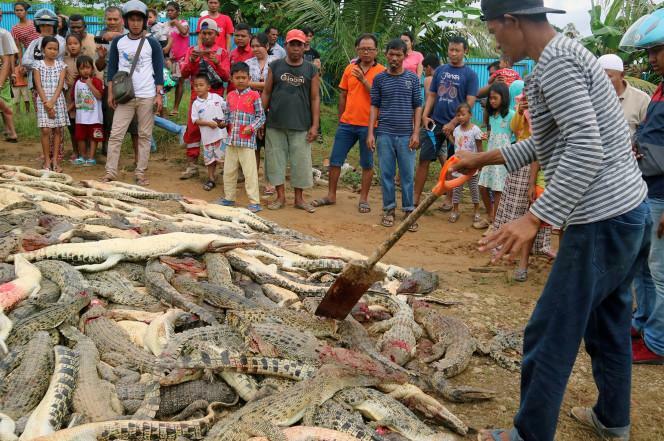 A man was killed by a crocodile at a breeding farm in Indonesia and in outrage and revenge, Indonesian villagers using knives, hammers, and clubs slaughtered 292 crocodiles. The victim of the crocodile attack was a 48-year-old man and the head of Indonesia’s Natural Resources Conservation Agency in West Papua said he was likely picking grass for animal feed when he was attacked. The victim was buried on Saturday. After the burial, villagers went to the farm and killed all the crocodiles they could find. The news agency Antara released photographs that showed bloodied carcasses of the crocodiles in a large pile in the Sorong district of the eastern Indonesian province of West Papua. The said farm had been given a license to breed protected saltwater and New Guinea crocodiles in 2013 for preservation and also to harvest some of the animals. One of the conditions set for the approval of the farm was that the reptiles not disturb the community. Manullang said that his agency was coordinating with police in the investigation of the crocodile attack, and the succeeding events. It is not clear if the retaliatory attack the villagers made against the rest of the crocodiles will be justified and be dismissed, without any one of the attackers facing possible charges.